A revered son of the Old Dark Navy Blue, Charles ’Charlie’ Hammond was a five-time Premiership player for Carlton in the first decades of the 20th century. A tough, hard-hitting follower or defender, he walked out of Princes Park in acrimonious circumstances in 1910, but was convinced to return after a four-year absence. Three years after his playing career ended, he spent one season as a VFL boundary umpire. Sad to relate, Charlie was born in Collingwood, and grew up in inner-city Melbourne during the hard economic circumstances of the 1890’s. By his late teens, the solidly-built teenager with safe hands and a ‘take no prisoners’ attitude was a star footballer with the Northcote Brickfielders, having previously turned out with North Melbourne. His older brother Jack Hammond (Carlton and Melbourne), and younger brother Billy (Collingwood), (both of whom would have brief VFL careers) were talented players too, but Charlie was the pick of the litter. Meanwhile, two suburbs away in Carlton, the Blues were hell-bent on ending too many fruitless years without a VFL Premiership. Under secretary/coach Jack Worrall, Carlton had embarked on a wide-ranging campaign, intent on recruiting the very best players it could find. Charlie Hammond was soon invited to train at Princes Park, and Worrall was impressed enough to select him in the team to meet Essendon in round one of 1905. Alternating between the half-back flank and the back pocket, with occasional runs in the ruck, Hammond was a revelation throughout his first two seasons. Durable, tenacious and a fierce protector of his small men, Charlie capped off a dream year with a solid performance in Carlton’s glorious 47 point victory over Fitzroy in the 1906 Grand Final. Worrall’s hunger for success, with a team showcasing talent and experience, had delivered at last - but the best was yet to come. In 1907 Worrall asked Charlie to shoulder more responsibility in the ruck, working in tandem with George ‘Mallee’ Johnson. This pair formed a great combination, driving the Blues to the 1907 and ’08 flags as well. Johnson was superb in the ’07 victory, and Hammond dominated the match in 1908 when Carlton completed the VFL’s first hat-trick of Premierships. In 1909, Carlton went within a whisker of claiming four flags on the trot. We were only denied by a tenacious South Melbourne team that recovered from a six-goal hiding by the Blues in the Preliminary Final to win a Grand Final thriller by just two points. That defeat was the spur for simmering tensions to boil over at Carlton, ending Jack Worrall’s tenure, and causing seven of the club’s star players to leave with him. In March of 1910 a ‘reform group’ swept to power at Carlton’s Annual General Meeting. Bitter at constant bickering between the players, coach and committee, as well as the shock Grand Final loss, Carlton’s members voted almost all the incumbents out. Worrall immediately tendered his resignation – not for the first time - and it was promptly accepted. When Worrall left, seven of Carlton’s stars; ‘Mallee’ Johnson, Fred Jinks, Les Beck, Harvey Kelly, Frank Caine, Ted Kennedy and Charlie Hammond – went with him. Indicative of the quality and depth of the Carlton list at the time, the exodus turned out not to be a mortal blow – the Blues still made the 1910 Grand Final, only to lose to Collingwood by 14 points. Meanwhile, Hammond had returned to Northcote, who had been admitted to the VFA in 1907. He spent three more years with the Brickfielders, before repeated appeals (probably from his former team-mate, by then Carlton coach, Fred Elliott) convinced Charlie to return to Princes Park in 1914. Only months before the outbreak of World War 1, Hammond pulled on his new Navy Blue number 24 guernsey (player numbers had been allowed since 1911) and took up where he left off. More than most, ‘Pompey’ Elliott knew how crucial durability, experience and toughness was in a ruckman, which is why he did not hesitate to ask Hammond to lead the relatively inexperienced Carlton followers. And Charlie didn’t let him down. The Blues stamped their authority on the season as minor Premiers and, with no less than nine first-year players in the team, went on to beat South Melbourne by just six points in another hard-fought Grand Final. While it was a great achievement in Carlton’s Jubilee (50th) year, Australia’s Declaration of War against Germany in August cast a pall over the celebrations. Thousands of Australians volunteered for active service in the first six months of the war. In 1915, attendances at football games fell right away, and clubs found it tough to field quality teams. Carlton and Collingwood were the two standout sides throughout the season and fittingly, met in the Premiership decider. While the match may have lacked some familiar names, it was by no means short of skill or intensity. Only a brilliant five goals in the last ten minutes brought Carlton our fifth Premiership. Hammond worked tirelessly all match, using his experience to drift forward and kick two valuable goals. Only four teams; Carlton, Collingwood, Richmond and Fitzroy, made up the VFL in 1916. They played each other four times and all of them participated in the finals. In his seventh Grand Final in seven seasons with the Blues, Charlie was as tenacious as ever against Fitzroy, but the Maroons were too good this time and won by 29 points. 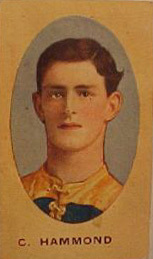 Charlie played on for two more seasons after 1916, while Carlton were bundled out of the finals early in both years. His last game came on August 31, 1918 – the Semi-Final match at the MCG, against South Melbourne. Just 41 days before the war at last ended on the 11th of November, 35,000 fans turned up to see a fitting finale to Hammond’s career. Both teams went hard at it from the first bounce, and scores were level late in the last quarter. But two goals to South, followed by a goal and a behind to the Blues, won the Bloods the Premiership by five points. Charlie gave his all as usual and could rightfully claim that with just a little more luck, he might have played in seven – not five - Premiership teams for the Blues. Although retired as a player, Charlie hadn’t quite signed off from the game that day. In 1921, aged 35, he came back to football as a boundary umpire and officiated in 11 VFL games. Seven years later, in 1928, Charlie was stricken with a serious illness and grave fears were held for his survival, so Carlton Football Club opened a public appeal for Hammond and his family. Testament to the affection held for him by the Blues, the sum of 236 pounds ($472.00) was raised in an era when the average weekly wage was 15 shillings (equivalent to $1.50 at 2006 values). Sadly, Charlie battled ill-health for the remainder of his life, and passed away on December 4, 1936 at the age of 50. One of just eleven players to have represented the Blues in all three of the club’s first (and only) hat-trick of Premierships in 1906-’07-’08, Charlie Hammond was a champion of his time, and a worthy inductee into the Carlton Hall of Fame in 1991. Articles: Carlton's Hat-Trick Heroes | Moving Guernsey Numbers - UP! | The Magnificent Seven! Contributors to this page: blueycarlton , Bombasheldon , molsey , PatsFitztrick , pblue , tmd1 , true_blue24 , Jarusa , WillowBlue and admin . Page last modified on Thursday 27 of November, 2014 08:21:49 AEDT by blueycarlton. 1978 - Bruce Doull Profile.